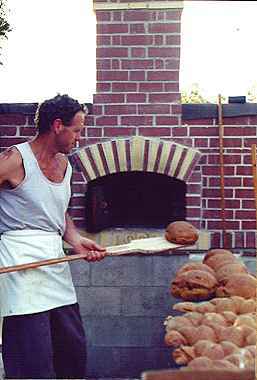 40 Desem loaves ready to be peeled out, the oven on the left is a small oven large enough to bake 12 hearth loaves at one time and the type I've built in many backyards. bensart@xtra.co.nz. 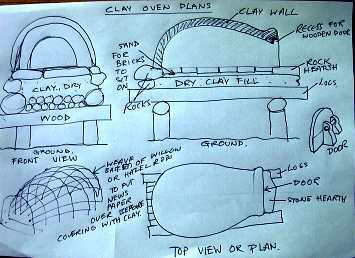 Below is a large and more sophisticated model with fire brick and a completely suspended hearth capable of baking several consecutive loads before heating again. 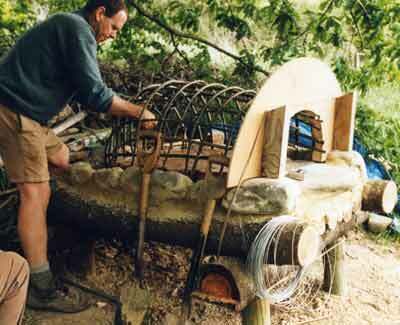 Over the years I have built many different sized ovens and started by using a form built from hazel rods. 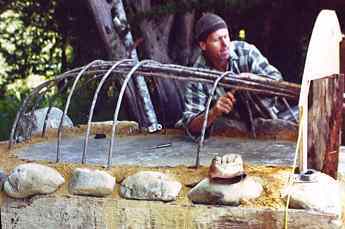 I have now changed this method of construction, and use wet sand covered in light plastic so it stays wet and holds it's shape while mudding the oven up. The mixture which forms the body of the oven is most important and the relative heights and volumes of the oven play a big part in an economical, efficient and aesthetic end result. 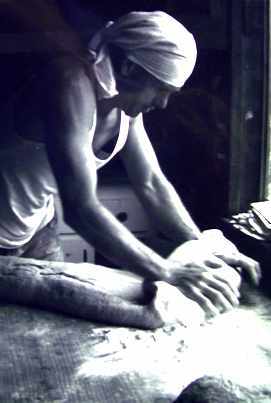 Kneading 50 lbs of Desem bread dough to develop its strength. This bread is made with hard organically grown winter wheat and follows an old Flemish recipe that relies on the symbiotic yeast that lives on this hardy grain. It seldom moulds if kept wrapped in a cloth and finely cut makes a most delicious toast. 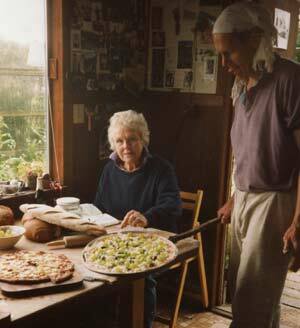 Front detail of heavy elm door for an oven we built in December 2001 at George's Tasman fruit oasis. Below a side view on completion. 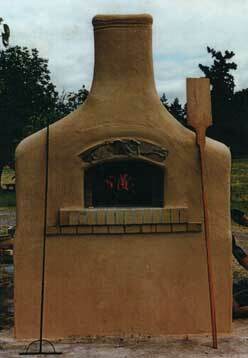 Another brick oven I built... 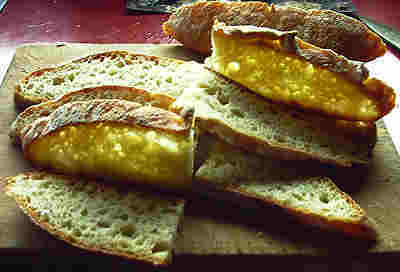 I'm just trying it out here with a variety of hearth baked breads. 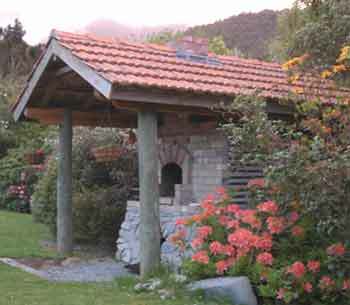 These ovens are wood-fired and use the residual heat left in the body and hearth of the oven after the fire has been stoked a couple of times and died down. They can be used for a great variety of cooking.... breads, pizza, beans, casseroles, biscuits, desserts and at lower temperatures the drying of fruit, seaweed and herbs. It's good to have lots of hands to mix and build. 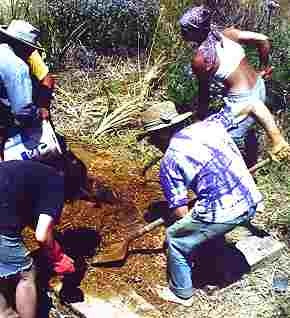 A crew hard at it. 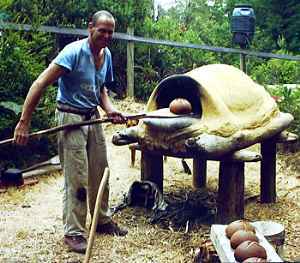 My good friend Vincent Carlton at the hearth of the Elk oven, peel in hand, experiencing the usual joie de vivre one feels at this time. 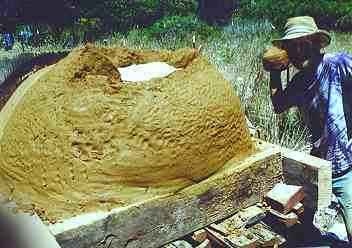 Finishing the sapling form after building the hearth of common red brick. 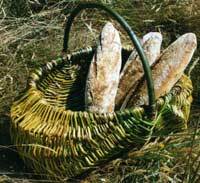 Fresh bread in fresh willow basket, I make these from roadside willow, another readily available renewable resource! 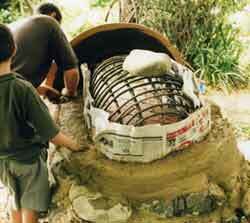 Starting to mud up the sides, the newspaper helps the clay follow the form. 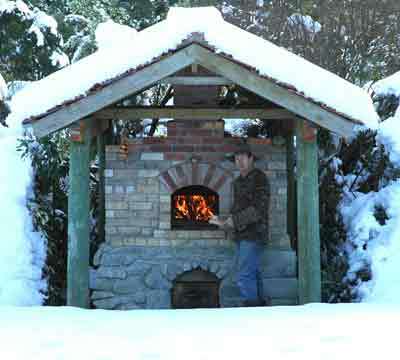 This is the most recent brick oven I've built, at home in Peel Forest New Zealand and we do get some snow in the winter... so when the power falls over I'm still able to bake. I mill rye and bake all my bread in this one and a whole lot more besides, even the Christmas cake which does a treat, long and slow. 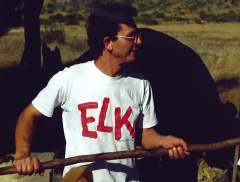 Click here to add text.hAVING SPENWhile traveling in California I met Alan Scot and helped build several ovens with him. 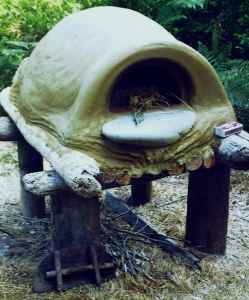 After a week with very enthused breadophiles at the American Wholegrain Bakers Convention in Washington State, I built a lot of clay and brick ovens, both being reliant on residual heat from a fire in the belly of the oven.